STOCKTON, Calif. (January 24, 2018) – The Port of Stockton announced the election of a new Chair and Vice-Chair for 2018. Following a vote by the Port of Stockton Commissioners, Sylvester Aguilar has been named Chairman and Stephen Griffen Vice-Chairman. 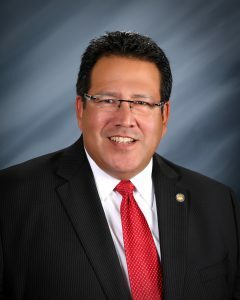 Mr. Aguilar is Senior Vice President and Business Banking Relationship Manager Team Lead for the Mid-Valley Business Banking Offices of Bank of the West. Mr. Aguilar is a Stockton native who is very active in the community. 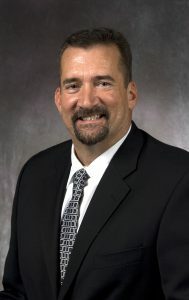 Mr. Aguilar serves on the boards of a number of area non-profits, including the CSUS College of Business Advisory Board, The Business Council and the Stockton Symphony Circle. He also is Past President of the San Joaquin Hispanic Chamber of Commerce. Mr. Aguilar holds a Bachelor’s degree from the University of the Pacific’s Eberhardt School of Business, is a graduate of Pacific Coast Banking School and has completed graduate work at Golden Gate University. Mr. Griffen, a lifelong resident of Stockton, began working at the Port as a longshoreman in 1977. Since 1984, he has been owner of Country Club Service and Bob’s Lube, and also is the owner of Country Club Smog. “Both Sylvester and Stephen bring unique and invaluable expertise to the Board of Commissioners,” said Elizabeth Blanchard, departing Chair for the Port of Stockton. “They are both Stockton natives and are committed to bringing new business and opportunities to the region. I am confident the Port will continue to flourish under their guidance. I am looking forward to working with the new leadership”.